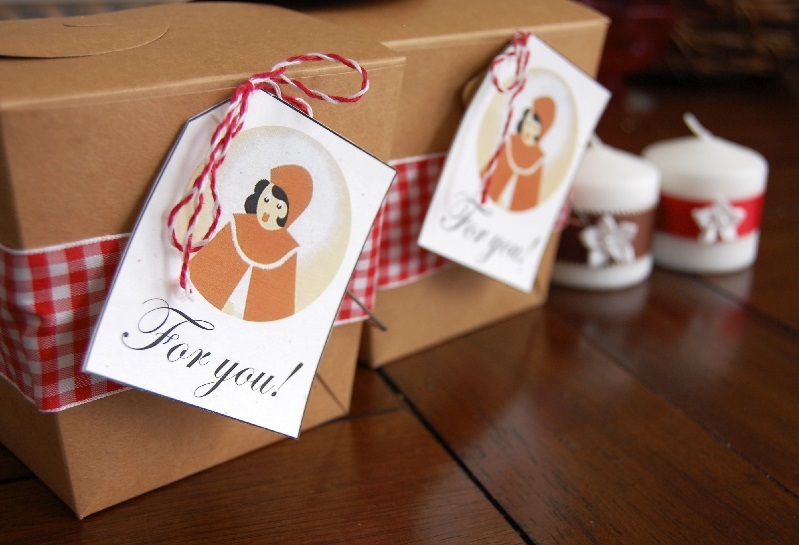 Little Red Riding Hood Favors are a fun addition to a themed baby shower or party. They can double as decorations and whether they’re homemade or store-bought they can be as extravagant or as easy as you want. Though they aren’t a requirement, favors are a good way to thank your guests for coming and celebrating with the mom-to-be. Your Little Red Riding Hood baby shower favors do not have to cost you a fortune. There are plenty of affordable ideas that are simple and easy to make yourself. With the right favors, your guests will remember the shower long after the party is over. Finger food that does not have to be refrigerated is ideal for edible take home favors. Cream cheese sugar mints or dipped pretzels are always very popular. For this Little Red Hiding Hood baby shower, I decided to make chocolate-dipped pretzels for guests to take home in their baskets. What would a Little Red Riding Hood party be without a basket full of goodies? Cupcakes and cookies are other sweet treats that would be welcomed gifts for your guests. Sugar cookies can be made in many different baby-themed shapes such as bottles, rattles, or onesies. Place the treats in individual favor bags and hand them out at the door. You could also incorporate sugar cookie favors into the décor by putting the cookies on lollipop sticks and using them as centerpieces for the tables. If you want to go more elaborate, you could have an entire cookie buffet and let the guests choose what kinds to take home in their gift bag. If you are not into baking, another option is to simply buy plain cookies or cupcakes and do the fun part of decorating at home. Most grocery stores sell ready-made icing packets that make decorating and personalizing cookies a cinch. A couple of other treat ideas are homemade caramels in paper cones, or perhaps suckers, which could announce “It’s a girl!” or “It’s a boy!” If you have a lot of empty baby food jars on hand, fill them with pastel candies and tie a ribbon around them to create a simple but cute gift. Of course, there are also endless ideas for Little Red Riding Hood favors for a baby shower or party that are not food. These really depend on how much you would like to spend. 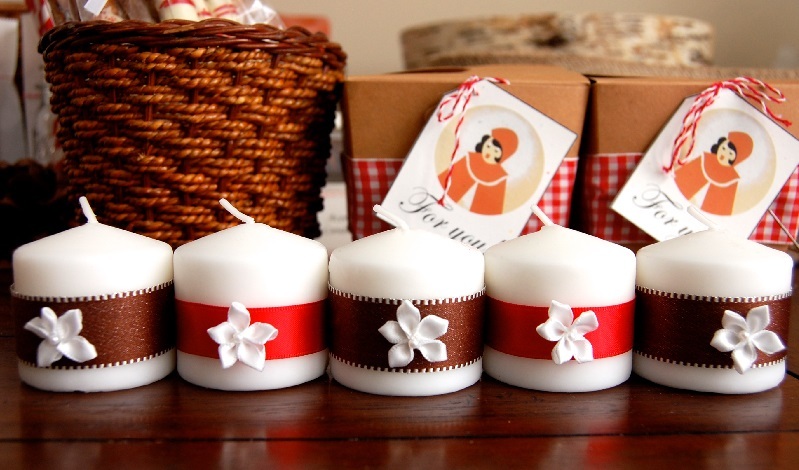 Candles are a gift that almost everyone will love to take home. For any baby shower, soap is usually a big hit as a favor. There are many different ways to play on the “shower” pun of giving out soap, such as “A ‘shower’ gift for you!” Magnets with the date of the shower can be a great gift that people can see on their fridge at home and be reminded of the great time they had. Or at the last baby shower I attended, someone told me about the idea of gifting nail polish to everyone, in shades of either pink or blue. I think this is a great idea! For Red Riding Hood though I would obviously have given out red nail polish. If you would like to make a favor specifically designated for the kid guests at the party, I highly recommend handmade crayon rolls. Very popular – you can never have enough crayons. One more, albeit pricier, option is to give out personalized tote bags. Your Little Red Riding Hood Favors can serve a dual purpose at a baby shower – don’t forget that they make wonderful decorations as well! They can be placed as a centerpiece stacked in the middle of the table, or you can put them on each person’s place setting before the shower starts to make sure that everyone receives one. For wrapping up your favors, you can use white paper bags, tulle, or simple clear plastic baggies. Tie closed with small ribbons, and feel free to add a small rattle or accessory to jazz it up. As you can see, there are many possibilities for how to thank your guests and leave them with a treat. And I’ve only listed some of the ideas! Bring out your creative side, or try creating favors that go with the theme. One thing for certain is that the guests will definitely appreciate it.